PC Gamer's best multiplayer game of 2014 is getting an expansion, and developer Matt Thorson has just announced that it's coming next week. Not only next week, but next Tuesday, which as calendar fans will know is in but three days. It's called Dark World, and you already know that, among other things, it adds critic Anita Sarkeesian to the local multiplayer archery-'em-up. If you're wondering what else it adds, have a butcher's at the above trailer, which has been released to coincide with the date announcement. 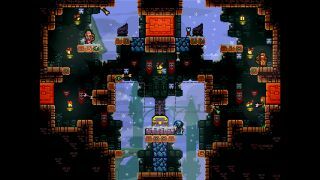 In short, the expansion adds the titular Dark World co-op mode, along with ten new archers, new towers and power-ups, and "endless procedurally generated levels". Dark World will set you back $9.99, on GOG, Steam, and the Humble Store.